Comeback Season: Sports After 9/11 is a new special exhibition at the National September 11 Memorial & Museum that chronicles the sporting world’s response after the 9/11 attacks. 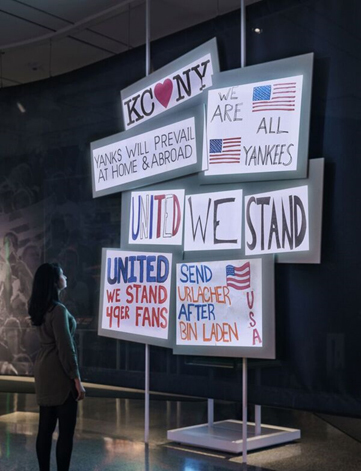 The exhibit highlights the vital role professional sports played in national mourning as fans rallied around a unifying message of hope and perseverance in the weeks and months following the 2001 attacks. A full halt of all U.S. sports followed the attacks, with stadiums in the New York metro area used to support the relief effort. The exhibition displays large-scale crowd images and custom documentaries depicting fans’ emotions as the careful resumption of sporting events played an important role in the country’s healing process. C&G Partners spearheaded the exhibition design and AV integration of Comeback Season. The company was tasked with exhibition layout, graphic design, sound and media production for the exhibition, which uses various AV treatments to communicate a narrative designed to echo actual sports experiences to exhibition visitors. Comeback Season is divided chronologically into nine sections, with additional stations dedicated to stories of victims and their families. Each of the nine sections includes dramatically large images, objects from the museum’s collection or on loan for the exhibition, poignant quotes and media. Comeback Seasonis divided chronologically into nine sections, with additional stations dedicated to stories of victims and their families. Each of the nine sections includes dramatically large images, objects from the museum’s collection or on loan for the exhibition, poignant quotes and media. Digital media is a central element of Comeback Season, and BrightSign’s XT1143 players are used to power video distribution throughout the exhibition. The media players distribute nine custom-made, short documentaries to large monitors located in various stations within the exhibition. These documentaries artfully combine oral histories with powerful media excerpts and custom audio scores to depict the emotions of sports fans during these turbulent times. BrightSign-enabled projection mapping intensifies the Halftime digital installation, one of the exhibition’s key elements. The large-scale projection map of fan-made ephemera shows the evolution of fan sentiment in the days, weeks and months following 9/11. Pairing BrightSign’s media players with projectors adds a powerful vitality to the tapestry of homemade fan posters projected onto three-dimensional panels. Comeback Season is BrightSign’s latest involvement in the 9/11 Memorial & Museum. The company’s media players also power video distribution for a large portion of the facility’s permanent exhibitions. Comeback Season opened in mid-Summer 2018 and runs until Spring 2019.